Alveolus (plural: alveoli), or pulmonary alveolus, informally known as air sac, is any of the innumerable minuscule, thin-walled, capillary-rich hollow cavities in the mammalian lung that serve as the primary sites of gas exchange between the atmosphere and the blood. 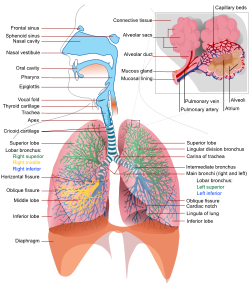 There are hundreds of millions of such air sacs in the human lung, appearing together in clusters (alveolar sacs) connected to the bronchioles. The alveoli are part of the remarkable harmony between the body and the environment, interfacing between the atmosphere and the circulatory system. The blood brings carbon dioxide from the rest of the body for release into the alveoli, and the oxygen in these spherical structures is taken up by the blood in the alveolar blood vessels to be transported to all the cells in the body. The term alveolus also is used for anatomical structures connected to the trachea in some insects and for structures that are part of the bird and dinosaur respiratory system. However, these are different structures and not part of this article. Lungs are the primary respiratory organs in air-breathing vertebrates, whereby oxygen from the atmosphere is transferred into the bloodstream and carbon dioxide from the bloodstream is excreted into the atmosphere. In the mammalian lung, air enters the roots of the lungs through the bronchi, having reached the bronchi via the trachea. The bronchi further subdivide into finer and finer pathways of branching airways, first giving rise to the smaller bronchioles, and then to the terminal bronchioles, and finally to the alveolar sacs. The alveolar sacs are made up of millions of tiny, exceptionally thin-walled air sacs called alveoli. These pulmonary alveoli are spherical outcroppings of the respiratory bronchioles and are the primary sites of gas exchange with the blood. 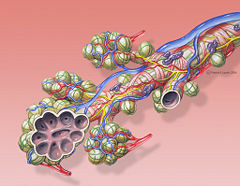 The alveolar sacs, which connect to the bronchioles via alveolar ducts, are in the form of clusters of alveoli, with each of the alveoli resembling individual grapes within a bunch. The term comes from the Latin alveolus, which means "little cavity." 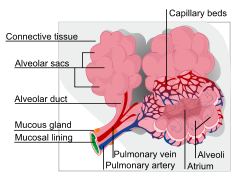 The walls of the alveoli are but one-cell thick and each alveolus is tightly wrapped in blood vessels (capillaries). The alveoli are found in the respiratory zone of the lungs. It is here in the alveoli that gas exchange occurs. Deoxygenated blood from the heart is pumped through the pulmonary artery to the lungs, where oxygen diffuses into blood and is exchanged for carbon dioxide in the hemoglobin of the erythrocytes. The oxygen-rich blood returns to the heart via the pulmonary veins to be pumped back into systemic circulation. Alveoli are particular to mammalian lungs. Different structures are involved in gas exchange in other vertebrates (Daniels and Orgeig 2003). The human lung contains about 480 million alveoli (Weibel 2008), representing a total surface area of about 70-90 square meters (m2). Each alveolus is wrapped in a fine mesh of capillaries covering about 70 percent of its area. An adult alveolus has an average diameter of 0.2-0.3 millimeters, with an increase in diameter during inhalation. The alveoli consist of an epithelial layer and extracellular matrix surrounded by capillaries. In some alveolar walls there are pores between alveoli called pores of Kohn. Type II cells that secrete pulmonary surfactant to lower the surface tension of water and allows the membrane to separate thereby increasing the capability to exchange gases. Surfactant is continuously released by exocytosis. It forms an underlying aqueous protein-containing hypophase and an overlying phospholipid film composed primarily of dipalmitoyl phosphatidylcholine. Macrophages that destroy foreign material, such as bacteria. Macrophages are large, phagocytic cells that defend the body against infection by ingesting invading microorganisms and other foreign bodies. The alveoli have an innate tendency to collapse (atelectasis) because of their spherical shape, small size, and surface tension due to water vapor. Phospholipids, which are called surfactants, and pores help to equalize pressures and prevent collapse. The following are some diseases associated with the alveoli. Acute respiratory distress syndrome. Acute respiratory distress syndrome (ARDS) is a severe inflammatory disease of the lung. Usually triggered by other pulmonary pathology, the uncontrolled inflammation leads to impaired gas exchange, alveolar flooding and/or collapse, and systemic inflammatory response syndrome. It usually requires mechanical ventilation in an intensive care unit setting. Infant respiratory distress syndrome. Infant respiratory distress syndrome (IRDS) is a syndrome caused by lack of surfactant in the lungs of premature infants. This syndrome can be caused by developmental insufficiency of surfactant production and structural immaturity in the lungs, and can also result from a genetic problem with the production of surfactant associated proteins. RDS affects about 1 percent of newborn infants and is the leading cause of death in preterm infants (Rodriguez et al. 2002). Pneumonia. Pneumonia is an infection of the alveoli, which can be caused by both viruses and bacteria. Toxins and fluids are released from the virus causing the effective surface area of the lungs to be greatly reduced. If this happens to such a degree that the patient cannot draw enough oxygen from his environment, then the victim may need supplemental oxygen. Cavitary pneumonia. Cavitary pneumonia is a process in which the alveoli are destroyed and produce a cavity. As the alveoli are destroyed, the surface area for gas exchange to occur becomes reduced. Further changes in blood flow can lead to decline in lung function. Asthma. In asthma, the bronchioles, or the "bottle-necks" into the alveolar sac, are restricted, causing the amount of air flow into the lungs to be greatly reduced. It can be triggered by irritants in the air, such as photochemical smog, as well as substances that a person is allergic to. Emphysema. Emphysemais another disease of the lungs, whereby the elastin in the walls of the alveoli is broken down by an imbalance between the production of neutrophil elastase (elevated by cigarette smoke) and alpha-1-antitrypsin (the activity varies due to genetics or reaction of a critical methionine residue with toxins, including cigarette smoke). The resulting loss of elasticity in the lungs leads to prolonged times for exhalation, which occurs through passive recoil of the expanded lung. This leads to a smaller volume of gas exchanged per breath. Chronic bronchitis. Chronic bronchitis occurs when an abundance of mucus is produced by the lungs. The production of this substance occurs naturally when the lung tissue is exposed to irritants. In chronic bronchitis, the air passages into the alveoli, the broncholiotes, become clogged with mucus. This causes increased coughing in order to remove the mucus, and is often a result of extended periods of exposure to cigarette smoke. Cystic fibrosis. Cystic fibrosis is a genetic condition caused by the dysfunction of a transmembrane protein responsible for the transport of chloride ions. This causes huge amounts of mucus to clog the bronchioles, similar to chronic bronchitis. The result is a persistent cough and reduced lung capacity. Diffuse interstitial fibrosis. Diffuse interstitial fibrosis, also known as diffuse parenchymal lung disease (DPLD) and interstitial lung disease (ILD) is a group of lung diseases affecting the interstitium of the lung: alveolar epithelium, pulmonary capillary endothelium, basement membrane, perivascular, and perilymphatic tissues. Lung cancer Lung cancer is a common form of cancer causing the uncontrolled growth of cells in the lung tissue. Due to the sensitivity of lung tissue, such malignant growth is often hard to treat effectively. Pulmonary contusion. Pulmonary contusion is a bruise of the lung tissue. Daniels, C. B., and S. Orgeig. 2003. Pulmonary surfactant: The key to the evolution of air breathing. News in Physiological Sciences 18(4): 151–157. Retrieved October 24,2008. King, T. E. 2005. Clinical advances in the diagnosis and therapy of the interstitial lung diseases. Am. J. Respir. Crit. Care Med. 172(3): 268–79. PMID 15879420. Retrieved October 24, 2008. Richardson, M. 2006. The respiratory system part 2: Trachea to alveoli. Nursing Times 102(22): 24-25. Rodriguez, R. J., R. J. Martin, and A. A. Fanaroff. 2002. Respiratory distress syndrome and its management. Pages 1001-1011 in A. A. Fanaroff and R. J. Martin, eds., Neonatal-perinatal Medicine: Diseases of the Fetus and Infant, 7th ed. St. Louis: Mosby. ISBN 0323009298. Weibel, E. R. 2008. How to make an alveolus. Eur. Respir. J. 31(3): 483–485. PMID 18310393. Retrieved October 24, 2008. This page was last modified on 16 June 2015, at 18:34.